Do you like to give gifts in mason jars? There are so many ideas for what to put inside-candy, jams, cookie mixes, candles, even sewing kits. Here's how to wrap them up so the contents are a surprise: cute fabric drawstring bags! I recently made a drawstring bag using this tutorial by the very talented sewist, Pam from Threading My Way. She created a lovely, fully lined bag. I made a few changes to the process, then created several sizes to accommodate mason jars in all sizes from 4 oz. to quart! Now the lucky recipient gets two gifts- the contents of the jar, and a pretty fabric bag. You could even make the bag from non-seasonal fabric so they could use it year-round. All seam allowances are 1/4", unless otherwise noted. Pictures show the largest bag (quart size) being made. 1. Find the size jar you are using in the chart, above. Cut two rectangles of fabric for outer bag, and two rectangles of lining fabric. 2. Right sides together, stitch around sides and bottom of outer bag. Right sides together, stitch around both sides of lining. Stitch across bottom, leaving a 2" section open for turning the bags right side out later. 3. Press side seams open (makes threading the ribbon through later much easier), trim corners. Turn outer bag right side out. 4. Tuck outer bag inside lining, right sides together. 5. Match the top upper edges and side seams. Pin. 6. Stitch tops together, then turn both bags right side out through opening in lining. Tuck lining into outer bag. Press top edge of bag. Slip stitch opening in lining closed. 7. Mark two stitching lines, one 2" down from top of bag, and one 2 and 5/8" down from top of bag. Mark with chalk or air-soluble marker. OR, you can mark these distances on a piece of tape on the plate of your sewing machine. Stitch all around bag on both sets of lines, backstitching a few stitches across each seam. Important note: this largest bag is the only one to have a 2" space at the top. All the rest of the bags have a 1" space at the top. For all the other size bags, measure down 1" from the top of bag for the first row of stitching, then 1 and 5/8" down from the top of bag for the second row of stitching. 8. Using a seam ripper, open stitches at seam between rows of stitching on outer bag side only (do not open stitches on lining). Do this on both sides of bag. This is why you did the backstitching/double stitching in step 7. It keeps that one little opening from unraveling further. 9. Using a large safety pin or bodkin, thread a length of ribbon through one side of casing, bring it back out through the same side and knot the ends. Cut the ends at a 45 degree angle to prevent fraying. Repeat with second length of ribbon on other side. Enjoy wrapping up some goodies! Mason Jar Gift Bags may have gone to these fun parties, including Metamorphosis Monday! What a great idea and tutorial! I think even I can make this with the help of your instructions. Thanks! Amara and I are planning to make your praline sauce for her other Grandpa -- maybe we are going to have to whip up a bag to put it in, too! Thanks Joy! What a cute idea, Joy. So clever. This is such a sweet way to give a gift vs. a part gift bag. These are a great idea! I've never thought about this. Thanks for sharing! These are beautiful and a wonderful idea. My boys like to sew and these look like something we can work on together for teacher gifts this Christmas! Thank you for sharing these! We are planning on doing a lot of Mason Jar gifts this year! These will be perfect!!! Thank you! what a cute idea Joy, jar gifts just got better! I love these! Mason Jars are so popular and people love them, and this project just makes them better! Thanks so much for sharing the instructions; I can't wait to make one to compliment my gifts this year. Have a great week! What a cute idea. Pinned. These are just adorable…love mason jar gifts! These would be cute to put under the tree for the grandchildren! these are so cute! such a neat idea.. These will look fabulous under the Christmas tree, Joy!!! A great idea to make them for gift jars. Thanks so much for the link backs. Wow, you are so very clever! My sewing skills aren't quite that good unfortunately!! Great idea. I'm always looking for easy ways to use all the fabric I just have to have. Thanks. The bags are adorable. And mason jar gifts are so wonderful for everyone. The possibilities are endless. These bags are truly perfect for mason jars, but I would also pack cookies and other things in them too. You are truly talented and amazing with all your sewing ideas. So very cute and such a great way to 'wrap' a gift! What a great tutorial, for something very useful. :D Thanks! I need to make some of these. Thank you for sharing this great little tutorial. Such a wonderful and attractive gift idea. I found your blog through the Round Tuit linky party. I love giving homemade gifts in mason jars and these bags are the cutest, Joy!!! Oh yes I love mason jars. They are so incredibly versatile. Now they make an even cuter gift with these bags. Great tutorial. So cute!!! I am pinning these to make for gifts!! TFS!! I am stopping by from Sew Crafty Angel's Wake Up Wednesday Linky party and a co-host. Here is what I will be sharing this week: http://craftybrooklynarmywife.blogspot.com/2014/11/lounge-pants.html Stop by when you have a moment. These are really cute bags to use for the mason jars, (one of my secret passions) I can see how they would be good for Valentines too. Thanks for sharing on Friday Features Linky party. Thank you for joining us this last weekend on #PureBlogLove recipe and DIY craft Link Party! I hope to see you this Thursday night again, the party starts at 8 pm EST and runs all weekend! I can't wait to see what you're cooking up next! Love this idea, Joy! 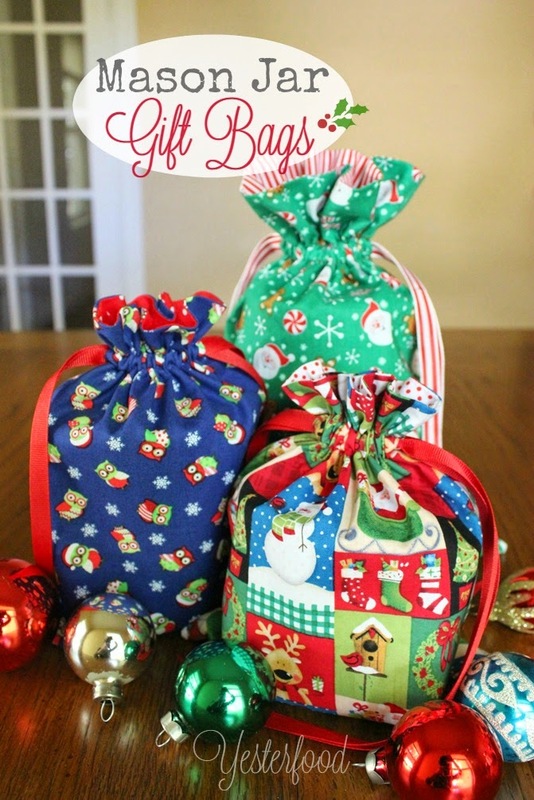 Your fabric bags are so cute and really make the gifts extra special. Thank you for sharing this idea with us at the Hearth and Soul hop. Pinning, sharing and will be featuring your post in my Hearth and Soul post later today! Thanks so much for the cute bag & tutorial. And recipes! It's a 'win, win' for me. Very nice, thanks for sharing with Hearth and soul blog hop. pinning. The bags are so cute Joy. 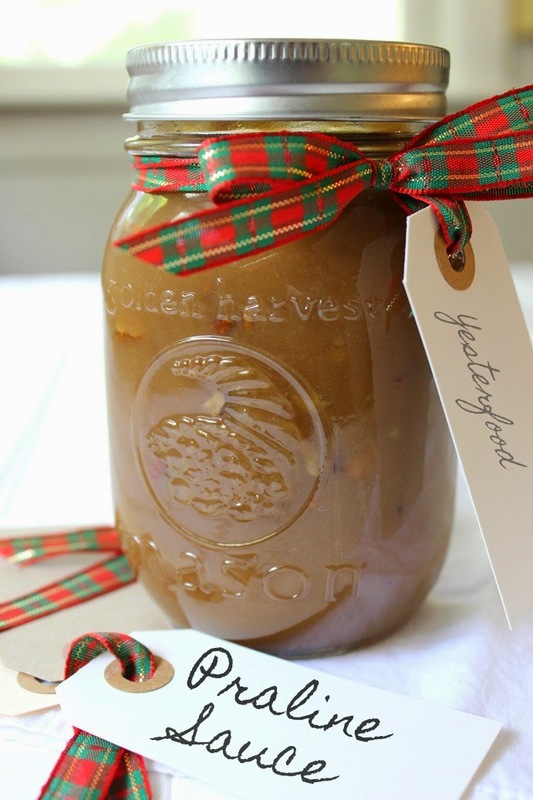 Jars are so perfect for homemade gifts and the bag is the extra little bonus! Thanks for sharing with SYC. Congrats! you have been featured on Wake Up Wednesdays for this post. Great idea! So much more festive than just the tag. Thanks for linking up to Show Me Saturday! This is a lovely idea for giving gifts, thank you for sharing. I found your link from Karen's blog Sew Darn Crafty. You wrote great instructions Joy - wonderful suggestions on filling those jars too! I love Mason Jar gift ideas and I would always buy bags, but your tutorial is the best I've found! The instructions are so easy to follow and the bag turned out super cute! I'm giving all my family members some sort of Mason Jar gift! Thank you so much for this! Lovely Gifts I really want to make such things for kids and I found your lovely blog it will be very helpful for me. Gift jar, - Get the best deal on jar decorations, solar jar, solar hanging lights, mason jar lights, mason jar solar lights, solar mason jar lights, decorative jars, jar solar light, gift jar & solar jar lights at amazon.com from great selection at Sogrand Industry Inc Store. Party jar, - Get the best deal on party jar, bar jar, mason jar solar lights, solar mason jar lights, tabletop decorations, solar jars, solar jar lights, table decorations, garden jars & gift jars at amazon.com from great selection at Sogrand Industry Inc Store.